♥ Chasing 26 ♥: Merry Christmas! I'm not sure if I'll even have time to post in the next couple of days. Plus, I don't want to miss out on valuable family time over the holiday weekend by planting myself in front of a computer to spout out some randomness. So, "Merry Christmas!" to all those who celebrate - and even those that don't. Because the sentiment isn't always about the religion, sometimes it's about the Good Will Toward Men. The plan for the next couple day - survive. Crossfit is closed til Monday and no Get Fit run this weekend, so I'm on my own. Tomorrow, I'm heading to La' Fitness for some cardio and maybe some modified Crossfit on my own. Saturday will be a wash, unless you count the ice skating that James and I are planning to do while the boys are celebrating with their mom & her family. Sunday will be in the road to visit my family. Eating plan is to enjoy the holiday within reason. Eat to enjoy the flavor and the love that dishes/sweets were prepared with, not because it's "there." Plan snacks on the road for Sunday (both trips) and most importantly, not to stress when meals are out of my control. I wish everyone a safe and joyful holiday weekend. Hope Santa is good to you all! I did a bootcamp last year that was associated with Crossfit. 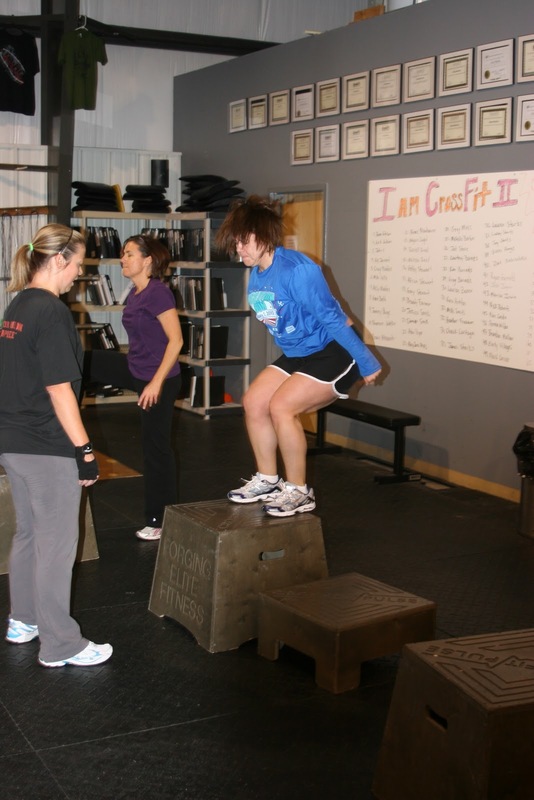 I HATED box jumps. I was always so scared that I wouldn't jump high enough. AWESOME box jump - and picture! Love the hair. Hope you are enjoying the holiday weekend!